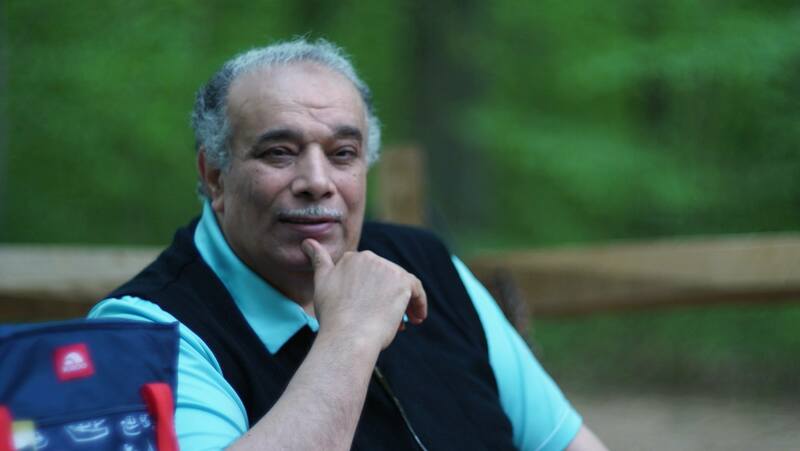 Headlines: This is an interview with the controversial Muslim thinker Dr. Ahmed Subhy Mansour, who lives currently in VA, the USA. "We felt at first that Al-Sisi was a good man of reform, but we opposed him very early"
"Transition of power and authority within the countries of the Muhammadans is merely leading to chronic tyranny"
"Wahabism of the KSA is both the axis of evil and terrorism in the world and the arch-enemy of Islam"
"The West has become progressive when it applied principles of the Quranic sharia legislations of Islam"
"Egypt needs a civil, secular, democratic regime that protects human rights"
Dr. Ahmed Subhy Mansour was never deterred or intimidated by persecution he suffered in Egypt by Al-Azhar and Mubarak regime, incited by the KSA, as his stances and reformist ideas provoked their ire. He was a former professor at Al-Azhar University, in Egypt, and currently, he is the head of the VA-based International Quranic Center (IQC) and he has launched the Quranism website (www.ahl-alquran.com). His intellectual endeavors and projects focus on removing falsehoods, lies, and fabrications added forcibly to Islam in the Middle-Ages, and notions never authorized by God in the Quran. he attempts to reconcile Muslims of today with all countries on the globe, and he peacefully fought with his ideas to clear the name of Islam from the heinous crimes of terrorism perpetrated in its name, turning it from a religion of peace to a creed of terrorism and massacres. Our website and journal Shabaket Masr 24 has interviewed this controversial Islamic thinker. QUESTION: You have been the first thinker to reject Sunna hadiths and to launch the Quranist theory and methodology whose motto is (the Quran is the only source of religious legislations); yet, the KSA and other Arab countries (especially Al-Azhar institution in Egypt) regardless of their doctrines insist on including hadiths within Islamic sharia laws. On what grounds have you reached the conclusion that real Islam is Quranism? ANSWER: We have sought the Truth since we were a student at Al-Azhar schools; when we were 14 years old, we rejected the deification and sanctification of a mausoleum in our natal village (Abou Herez, in Kafr Saqr, Al-Sharqiyah Governorate, Egypt). Most of the villager at the time believed in such a mausoleum as 'holy' site, and those who reject such polytheism was persecuted by the relatives and family of the Sufi 'saint' entombed inside such tomb, as they gained lots of money from this mausoleum of their forefather. We stood against such a myth and never felt afraid of such a family. When we were working on our PhD thesis, we insisted to tackle the influence of the Sufism of the Mameluke Era on Egypt, and we have debunked and exposed Sufism as a wicked, evil man-made religion contradicting Islam (i.e., the Quran). At the time in the 1970s, when we were in Egypt and obtained our PhD degree, we used to be a 'moderate' Sunnite who rejects hadiths partially. Because we have been a professor at Al-Azhar University who opposed the head of Al-Azhar, the Sufi sheikh/imam Abdel-Haleem Mahmoud who led all Sufis in Egypt and Al-Azhar at the time, Wahabis inside Al-Azhar University and outside it celebrated our PhD thesis and our other books later on that refute and undermine Sufism and Sufi 'saints'. Sunnite Wahabis of Egypt appointed us at the time as the secretary-general of a Wahabi group called (The Call of the Islamic Truth) and the supervisor editor of its magazine (Prophetic Guidance). In the 1980s, we were the leading imam and sermonizer of this Wahabi Sunnite groups in its many mosques in various Egyptian cities. We used to write articles in the magazine refuting and denying some Sunnite hadiths that contradict the Quran, and we focused on hadiths we have debunked in our PhD thesis, including the one about God taking those who harm saints as enemies and hadiths about any miracles performed for or by Muhammad. At the time, we used to quote hadiths, which only apparently do not disagree with the Quran, within our articles and books, even the books we taught at al-Azhar University. Later on, we have reached the conclusion that all hadiths are wrong and useless and never part of Islam. This was made clear to us when we have refuted the hadiths about the so-called intercession/mediation of Muhammad on the Last Day and those hadiths making Muhammad as the best human being and the best messenger/prophet of them all and making him infallible and 'holy immortal' being. We have decaled this view of negating and denying all of hadiths and Sunna in five books we have authored and taught to our students in 1985, as we used to teach in more than 10 faculties within Al-Azhar University inside and outside Cairo. We were suspended from work and our financial dues were confiscated, while we were prevented from going abroad and getting promoted. This persecution and interrogation went on for two years, and we had enough time to preach sermons within Cairene mosques, and people who gathered around us and rejected hadiths came to be known later in 1987 as the Quranists. They were incarcerated alongside with our person in Nov., 1987. After our release, we worked as a freelance writer of articles in many journals and within civil society organizations. Our writings and books of the 1990s reflect Quranism theory (i.e., the Quran is the only source of Islam), such as this following list of books published on our website: (Naskh), (Interpreting the Quran), (The Myth of the Torment Of the Grave) in English on this link: http://www.ahl-alquran.com/arabic/book_main.php?main_id=101(The Quran: Sufficient as a Source of Islamic Legislation) in English on this link: http://www.ahl-alquran.com/arabic/book_main.php?main_id=92and (The penalty of Apostasy) in English on this link: http://www.ahl-alquran.com/arabic/book_main.php?main_id=91and within various articles. Thus, books of hadiths and fiqh are never to be deemed as authority or references within Islam, and clergymen and religious institutions of the Muhammadans never accept the fact that the Quran is the only discourse in Islam; they insist on including books of Sufis, Sunnites, and Shiites within their earthly, man-made religions. It is very wrong to deem such books authored by men as holy or sanctified divine revelation; Quranists consider such books of fiqh and hadiths as devilish/Satanist revelations. In the Quran, God commands all pious believers to believe only in one discourse: the Quranic text as God's Word: "...Which discourse, besides this, will they believe in?" (7:185); "In what discourse, beyond this, will they believe?" (77:50); "These are God's verses which We recite to you in Truth. In which discourse, after God and His verses, will they believe?" (45:6). Such fabrications in the books of the Muhammadans are deemed by them as 'Islamic' sharia laws, though such books contradict the Quranic sharia of Islam. For more details on that topic, we refer you to our two books (in English): (The Seven Principles of the Real Islamic Sharia and How to Apply Them) on his link: http://www.ahl-alquran.com/arabic/book_main.php?main_id=80, and (The Judicial Authority between Islam and the Muhammadans) on this link: http://www.ahl-alquran.com/arabic/book_main.php?main_id=100, by the way, God predicts in the Quran the existence of such devilish, Satanist revelations; see 6:112-116. QUESTION: You have considered Salafism/Wahabism as a dangerous ideology contradicting the Quran and its higher values and sharia legislations and threatening Islam, and you assert that the MB group, Salafists, Al-Qaeda, etc. desire to move back in time to the Middle-Ages; what lines of evidence would support this view of yours? ANSWER: There are so many Quranic verses that support this view and the documented history of Wahabi terrorists proves our assertions. For more information, we refer you to our books and lengthy articles such as: (The MB 2012 Constitution in Egypt), (The Ibn Hanbal Doctrine, the Mother of Wahabism, and the Destruction of Iraq during the Second Abbasid Era), "The Roots of Terrorism in the Saudi Wahabi Doctrine and the Muslim Brotherhood Terrorist Organization" (found in English on this link: http://www.ahl-alquran.com/English/show_article.php?main_id=15322), (The Wahabi Opposition Movements in the Kingdom of Saudi Arabia in the Twentieth Century) (found in English on this link: http://www.ahl-alquran.com/arabic/book_main.php?main_id=85), and (The Cursed Religion of ISIS)(found in English on this link: http://www.ahl-alquran.com/arabic/book_main.php?main_id=73), and tens of articles exposing Wahabism, the KSA, and the terrorist MB group. some of our other books are translated into English on our website, and we refer readers to it. QUESTION: Most Arabs now view ISIS as funded and created by the West, Zionism/Israel, and the USA and some claim that the Syrian regime created ISIS, and very few people like you assert that the KSA and its Wahabism are behind the creation of ISIS and that the heinous crimes of ISIS terrorists have nothing to do with Islam. Could you elaborate on this further? ANSWER: Of course, ISIS, the terrorist MB, Al-Qaeda, etc. are Sunnite Wahabi criminal organizations made and funded by the KSA, and they seek to reach power in many countries. Wahabism is the root of all evil and all terror worldwide today. Wahabism of the KSA is both the axis of evil and terrorism in the world and the arch-enemy of Islam. The KSA is a cancer on Planet Earth. We have explained in our book titled (The Wahabi Opposition Movements in the Kingdom of Saudi Arabia in the Twentieth Century) how Wahabism contain quasi-religious justification to make other power-seeking Wahabis declare Wahabis who rule (e.g., in the KSA) as infidels who must be overthrown by force within revolts. This is why Wahabi extremists are the prominent opposition figures inside the Wahabism-based KSA. Terrorist Wahabis seek to reach power within many countries that have military regimes, secular regimes, or Shiite regimes. QUESTION: Islamist political movements (i.e., Islamism) call for a revival of the caliphate system as if this is part of Islam; how have you refuted their claim? QUESTION: In your opinion, what makes Arab people afraid of the revival of the caliphate rule system? What proves that Wahabi movements (or Islamism/ political Islam) are dangerous? ANSWER: the caliphate is embodied and applied now by ISIS terrorists; this is not to mention atrocities committed by the KSA and its royal family who own the Arabian land and people living in it! this is the same claims and mottoes of most caliphs in the Middle-Ages. This is the worst type of injustices against people and against God, as they oppress and suppress people in the name of Islam. Real Islam (i.e., Quranism) is the religion of justice, peace, freedom, mercy, and equality. Quranic teachings of Islam help in stopping all types of injustices. QUESTION: Could you tell us more about your view of Islam as a secular religion by nature, a view we see frequently in your articles and books? ANSWER: Islam is secular in the sense that the Quran never mentions that it contains clergymen or religious institutions. There are no mediators in Islam between the human beings and God. in Islam, sanctification and deification are dedicated only to God 100%, without any percentage to mortals or things/items. This is Islamic equality as all human beings are creatures of our Creator: Almighty Allah. It is sinful to misuse Islam (or any other religion) within political life; this is an insult to God, as we have proven in our book titled (Warning to Muslims against Mixing Religion and Politics). Within many of our writings, we have asserted that the Islamic Shura consultation (http://www.ahl-alquran.com/English/show_article.php?main_id=12747) means that the Quran-based country must apply absolute religious freedom and direct democracy; the role of the State is to serve citizens, NOT to make them enter Paradise in the Hereafter. Being guided religiously is an individual responsibility and personal choice, with results of it shown on the Last Day before the Eternal Judge: our Lord God. Any peaceful citizens within a Quran-based country are Muslims regardless of their faiths and denominations (or lacking of any). Thus, hypocrites within the Quran-based Yathreb city-state of Muhammad enjoyed full, unlimited freedom of expressing political opposition peacefully and their religious freedom of rejecting Islam, and they lived in peace in Yathreb, and no one punished them as they were peaceful persons who never raised or took arms against peaceful believers. Punishment for disbelief is ONLY in the Hereafter exacted by God; in fact, God in the Quran promises hypocrites to dwell in the lowest depth of Hell. QUESTION: Does Al-Azhar today reflect 'moderate' Islam? ANSWER: Not at all; this institution has nothing to do with Islam; it reflects only Wahabism. In fact, it is a cancerous Wahabi colony in Egypt. This is the worst and most degenerate phase of the history of Al-Azhar. If it remains without the required immediate reform, it will remain as an obstacle that hinders real reforms on all levels in Egypt. QUESTION: How can we eliminate extremist, fundamentalist religious thought threatening Egypt? ANSWER: By establishing and protecting absolute religious freedom for all Egyptian citizens; people are free to be atheists/disbelievers or to follow/convert to any denominations. This freedom include the right to preach, proselytize, and practice rituals of all religions. No persons or institutions should interfere in the political and religious freedom of anyone, nor in the freedom of thought and expression. This is applied in the West now as one of the factors leading to advancement. In fact, the West has become progressive when it applied principles of the Quranic sharia legislations of Islam, especially absolute religious freedom and stopping all sorts of inquisition. QUESTION: Is it OK to have Salafist and other religious political parties, since they have followers and supporters? How can you evaluate their performance? ANSWER: This is OK only in case democracy is applied within absolute religious freedom and laws criminalizing religious violence and raising arms for religious reasons. There must be laws to ban religious persecution and coercion in religion and to protect freedom of thought and expression. The sad fact in Egypt is that only Sunnite Wahabis enjoy freedom to preach and proselytize, whereas Egyptian Shiites, Copts, Baha'is, etc. cannot have the same rights. QUESTION: You have supported the 25th of Jan. 2011 revolt and you have oppose against the MB when they reached power in 2012. Why are you opposing religious parties ascending into power, then? ANSWER: When we were living in Egypt, we opposed the Mubarak regime within our articles and we never flattered Mubarak. This is documented and known. We are still against the terrorist MB methods, ways, and sharia. The military regime in Egypt is bad, but worse than it is the theocracy of Salafists and the MB. Once we immigrated to the USA, we have become more vociferous in our attacking the Mubarak regime within our articles. We have been an activist along with our biological sons in Washington in organizing opposition movements (among Egyptian Americans) against the Mubarak military regime. The ouster of Mubarak was the best day of our life, and so was the day of the ouster of Morsi. We felt at first that Al-Sisi was a good man of reform, but we opposed him very early. We refer you to our book on Al-Sisi in English titled: (A Witness of the Earliest Months of The Presidential Term of The Egyptian President Al-Sisi) found on this link: http://www.ahl-alquran.com/arabic/book_main.php?main_id=77. We are a Muslim thinker and writer who writes against tyranny and injustices and who promotes values of freedom, justice, human rights, and human dignity. QUESTION: You have attacked the military regime in Egypt, but you have supported the 30th of June revolt and welcomed Al-Sisi as president at first; how come? ANSWER: Because Wahabis reaching power is a veritable disaster and catastrophe leading to bloodshed and more violence, injustices, oppression, and suppression. This is because there is no real democracy in Egypt. To spread the culture of democracy there, absolute freedom of thought/opinion and absolute religious freedom must be established and protected by law. Laws must protect peaceful political activities and ban all violence committed for political or religious reasons. Education in Egypt must be reformed and radically changed, and religion must never be taught in schools; instead, let us teach human rights to students and pupils, along with critical readings of history (especially of the so-called companions, imams, and caliphs). Thus, legislative reforms are required to raise people's awareness. Otherwise, democracy will remain a mere décor or façade to hide corruption, enslavement, and tyranny. QUESTION: How would you evaluate the political situation now in the Arab world, especially when Wahabi parties gain more followers? ANSWER: The transition of power and authority is easy in the West democracies within transparency. In contrast, the transition of power and authority within the countries of the Muhammadans is merely leading to chronic tyranny. Long-enthroned tyrants persecute, incarcerate, exile, gag, kidnap, and silence qualified experts in al fields, and the nation remains without real thinkers. The cronies and henchmen of tyrants control minds of citizens via media and religious institutions and clergy. When tyrants are ousted, the only strong opposition movement that remains is of the power-seeking Wahabis who are evil and faithless mob. This means that nations are liable to disintegrate and collapse, as we have seen in Somali, Libya, Syria, Iraq, and will occur soon enough in the KSA and Sudan. This is a catastrophe that must never occur in our beloved Egypt. We hope one day to see in Egypt a civil, secular regime that applies human rights, democracy, and justice. QUESTION: Is democracy fit for Arab countries and nations? Are Arabs need more guidance in that respect? ANSWER: Democracy will never be established in societies dominated by the Shiite religion or Wahabi Sunnite religion. It is silly that there are people in the 21st century who fight for Ali, Mu'aweiya, Hussein, Yazeed, etc. who died in the 7th century A.D.! we must get rid of such corrupt backward culture of the past (and to confine them to history books) and let bygones be bygones, so that we live the present and the future within secular politics, human rights, and democracy. QUESTION: Is introducing religious reform in Egypt of vital importance today? ANSWER: Certainly, it is the lifebuoy required now, provided that it will be realized within comprehensive reform measures on all levels, especially legislative, political, educational, and media levels.